By all accounts, 2019 will be more challenging than last year. But opportunity abounds! The pie may, or may not, be larger this year but your slice of it could! Q: Have you audited your operations and processes recently? Is your team spending too much time in each file? Does your staff unnecessarily touch a file more than once? Is your title software synced up with your workflow? A: Hire THE operations consultant experts in the title industry. Before you say, “They’re too expensive!”, stop. There are several brilliant title consultants who are reasonably priced and will have an initial conversation with you at no charge. They are gurus in the areas of workflow, operational efficiency and software optimization. Check out Kay Underwood and Brie McDaniel of http://titleinsuranceconsultants.com and Stephanie Fullerton of www.streamline.rocks. These ladies are smart, super-talented and practically guaranteed to make your title business operate better. Q: Has everyone in your company bought into the concept they are part of the “sales” process? I put “sales” in quotes, because it tends to be sort of a four-letter word around most offices. “I’m not in sales!” is not unusual for an owner to hear from someone with a title not ending in “rep”. But if your entire team isn’t in on growing the business your organization will suffer. Q: Is your operation spending time unnecessarily pre-closing getting basic intake information from buyers and sellers? Does your team spend one or more hours on each file calling homeowners, leaving voicemail message or sending emails just to find out if they have an HOA (sellers) or how they want the property vested (buyers)…and more? Are you struggling to read their handwriting only to type incorrect information into your escrow file? Are you protected if anyone with funds to close wires their money to the “bank of the bad guys” because they received a spoofed email? Million dollar (at least) answers that can make the difference between a good year and a great year! Blockchain And Real Estate: Will It Work? There is a lot being written about blockchains, bitcoin, and related technologies, and for many real estate professionals, this is part of a brave, new, confusing world of technology. Like the original internet, the blockchain is a revolution in technology that will touch all people and all businesses. So people are paying attention, but many still don’t understand what the blockchain is. Bob declares back to you, “You now own my Rolex.” There are 1,000 witnesses who can each declare, without a doubt, that your car now belongs to Bob, and the Rolex belongs to you. If anyone in the audience later tells a conflicting account of who owns the car or the Rolex, the other 999 people will refute it. And, if you take a spare set of your keys and try to give that same car to someone else, the 1,000 audience members will confirm that Bob owns the car, as each of them witnessed the “transaction.” This is the essence of how the blockchain works. In its most simple sense, the blockchain is a series of computers (thousands to potentially millions of them) that each keep the same record of an event or transaction in a ledger that is open to the public. Each record is encrypted, and the ledger is virtually hack-proof. Since all these computers see the same thing, they offer a consensus that the recorded event or transaction is valid. The most important value of the blockchain is that it allows two or more parties to interact with, say, a financial transaction, with no middleman. Interestingly enough, when people buy homes with bitcoin, they really are still buying with cash. It’s just being converted to bitcoin first. So, the next time you read about a bitcoin home sale, it is generally still a traditional cash sale. • Intellectual rights, patents, trademarks. • Medical records and history. • Personal records and credit history. As long as there is information that represents an agreement or record, the blockchain can record, encrypt and protect that information for eternity. 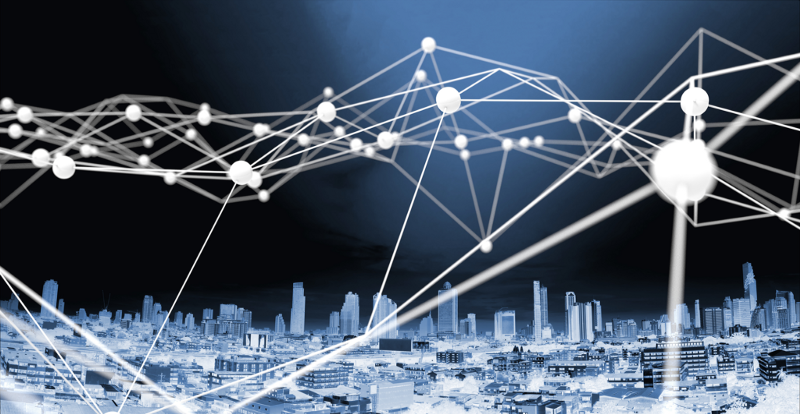 For real estate, the blockchain has the potential to change the way we do business. We are developing smart contracts, which will enable real estate contracts, escrows, property records (deeds, for example) to be completed and monies distributed without title companies or attorneys. These contracts are often compared to a vending machine concept: You deposit your money, and the machine spits out a product with no human intervention. In the near future, it may be possible for a homebuyer to buy a home and complete the sale (along with escrow and title insurance) by clicking on a shopping cart on a website. The blockchain will ensure that the buyer gets the title or deed and the seller gets the cash (via a cryptocurrency). The blockchain will also record the title or deed to the appropriate public records, such as a county in the United States or similar. Real estate professionals will continue to thrive in the era of the blockchain. The advice, knowledge and hand-holding of real estate professionals will always be an important part of a buyer or seller’s process. However, the handling of money and transactions will inevitably change, and that change is already underway. Brokerages will need to adapt their business models to understand and enable smart transactions but otherwise will continue to thrive in the era of the blockchain. Blockchain has the potential to disrupt the title industry. We should know more about it. There has been an explosion of interest in eClosings in the industry. Because of the savings of time and resources realized by the use of digital closings, lenders and title insurers are beginning to look into ways to utilize the technology. The Consumer Financial Protection Bureau sponsored a pilot that tested eClosings and it showed that the technology had a positive influence on the closing process. Government Sponsored Entities(GSE) have made eClosings a part of their scorecard when evaluation lenders. Consumers appreciate the advantages that digital closings bring to their experience. 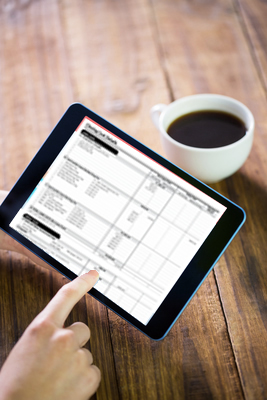 Digital Closings are making their way into the Real Estate closing process and title agents need to understand the process and how they can incorporate the process into their workflow. The presenter is Nancy G. Pratt who is the Vice President of Partner Relations and Government Affairs for Pavaso. She provides team leadership in attaining company goals, and manages the strategic relationships for the growth of the company. She is responsible in maintaining the relationships at Federal and State level, understanding key regulatory issues and laws that pertain to the operations of Pavaso. She is involved with Sales Support and strategy of the promotion and development of the Digital Mortgage Solutions throughout the Title agent network and lender segment of the industry. Nancy has over 14 years of experience in the eMortgage/eClosing space, which played a key role in leading the go-to-market and implementation strategies for Pavaso’s two CFPB pilots. 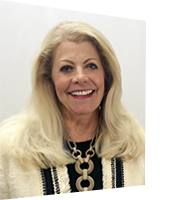 Nancy has been in the mortgage/title industry for over 35 years and highlights of her career include industry milestones of performing the first complete eMortgage with lenders and conducting the first ever FHA and VA eClosings. A tax-deferred exchange is a valuable investment tool that allows you to dispose of investment properties and acquire “like-kind” properties while deferring federal capital gains taxes and depreciation recapture. When insuring 1031 exchange deals, title insurance professionals need to understand the intricacies of the transaction in order to insure the deal. What if a taxpayer wants to acquire replacement property prior to the closing of the relinquished property? How does one dispose of their personal property investments while deferring capital gains tax and, in most cases, depreciation recapture? 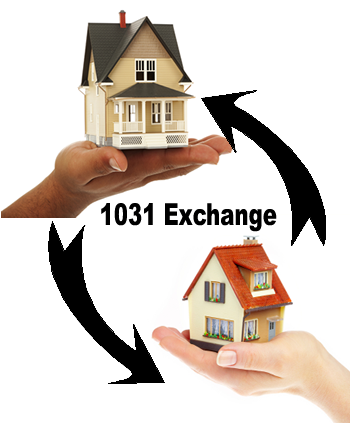 Learn all of these terms and more in this discussion of 1031 exchanges and how to insure them. Remember to update your profile so that you can enroll in a course for free on your birthday and be notified 30 days before your license expires so you have plenty of time to complete your CE requirements. Update your profile here. Michael began working in the title industry for his father in 1984 part time before entering high school. Since entering the field full time in 1989, Michael has examined over 15,000 real estate titles, written policies in excess of $100 million dollars, and handled closings of thousands of commercial and residential properties through out the country. Michael has served on the American Land Title Association’s education committee responsible for setting educational programs for the association from 2000 to 2008. He also has served on the ALTA’s Abstractors and Agent’s section committee to the Board of Governors. Currently he serves on the ALTA Public Relations Committee. Michael is a regular speaker for the title industry. He has been a featured speaker at the American Land Title Association Technology Forum; and the Missouri, Montana,Wyoming, Kansas, Michigan, Ohio, Nebraska, Virginia and South Dakota Land Title Associations. Michael is an alumnus of the University of Missouri, and was recognized by October Research as “top 40 under 40” in 2007. He enjoys travel, skiing and spending time with family. Michael has a proud legacy of family leadership in the title insurance industry. He and/or a member of his family has been active in the business continuously since 1920. Surveying or land surveying is the technique and science of accurately determining the terrestrial or three-dimensional position of points and the distances and angles between them. 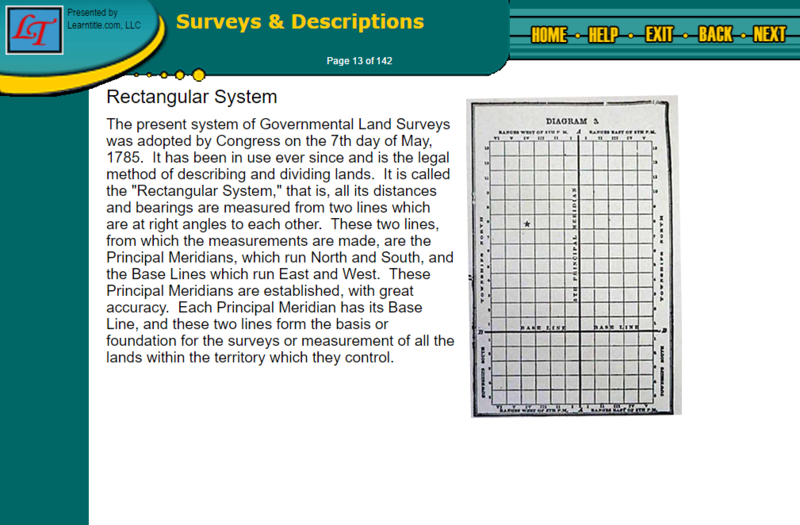 These points are usually on the surface of the Earth, and they are often used to establish land maps and boundaries for ownership or governmental purposes. For purposes of Title, they are used in the “Description”. To accomplish their objective, surveyors use elements of geometry, engineering, trigonometry, mathematics, physics, and law. This course discusses surveys and descriptions and their relationship the title insurance. Purchase the entire catalog and get a 30% discount. Catalog includes all 24 credits you need to complete your continuing education requirements. 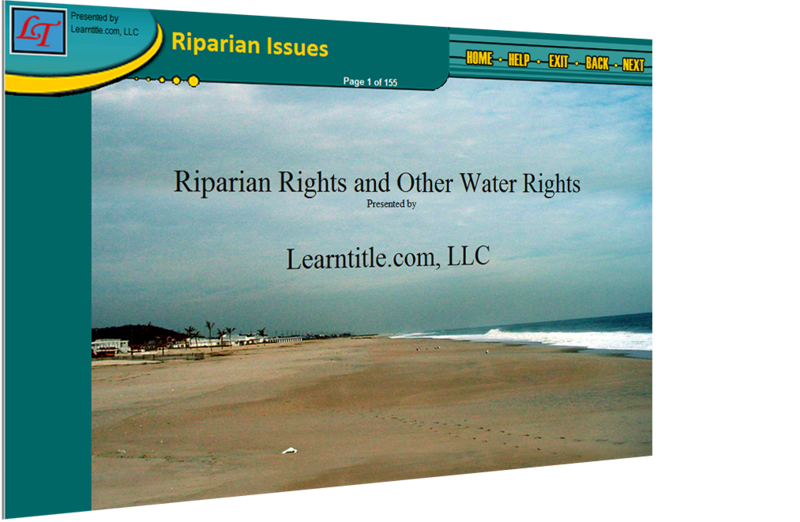 Tidelands or Riparian lands refers to lands flowed by the tide (and sometimes includes lands formerly flowed by the tide). The State of New Jersey holds title in fee simple to all lands currently or formerly flowed by the tide, unless it has already conveyed its ownership. This course is one in a series of Courses that discuss ALTA Best Practices. This one covers Pillars 5. The objective of the course is for the learner to complete the section of their policy and procedure manual for the pillars discussed in the course. Also, upon completion the learner will be confident that they will be able to pass an ALTA Best Practice audit for the pillars discussed in the course. Adopting appropriate procedures for the production, delivery, and remittance of title insurance policies helps ensure title companies can meet their legal and contractual obligations. Streamline Consulting has done the research and put together the content for the course. Streamline Consulting is a privately owned company that was formed in order to meet the personnel, technical and business needs of Title Insurance Companies. They are advocates for their clients in all aspects of the title insurance industry. While the nature of the business is the same in all states, the nuances of each title company, even within the same city, can be very different. Streamline customizes every project and product for each title company, regardless of size, location or products and services provided to their customers. Need courses in a different state?